The Graviti® Concrete is an extremely porous concrete-based material, used to manufacture a range of retaining wall products that do not require separate drainage systems, however for extra longevity these are sometimes specified or recommended. The extreme porosity enables a Graviti® retaining walls to act as its own all-in-one drainage system, thereby avoiding the need for a separate drainage system and therefore saving time, money and materials in the construction process. Gravity Wall Systems is Australia’s premiere company for Graviti® Concrete. The concrete mix is the secret to making the Graviti® products permeable enough to act as a drainage system, while not compromising the strength of the concrete. The Graviti® trademark incorporates a number of products created around the core Graviti® product – a no fines concrete mix, crucially maintaining the strength of regular concrete. Using the Graviti® concrete, we have so far produced a number of products designed to fit into the needs of the Retaining wall and Scour Control ‘industry’. They include the Graviti® Block and the Graviti® Mattress. Potentially, the Graviti® concrete can be tailor made to any shape to accommodate any situation which requires a retaining wall system or soil stabilisation system and or scour control. 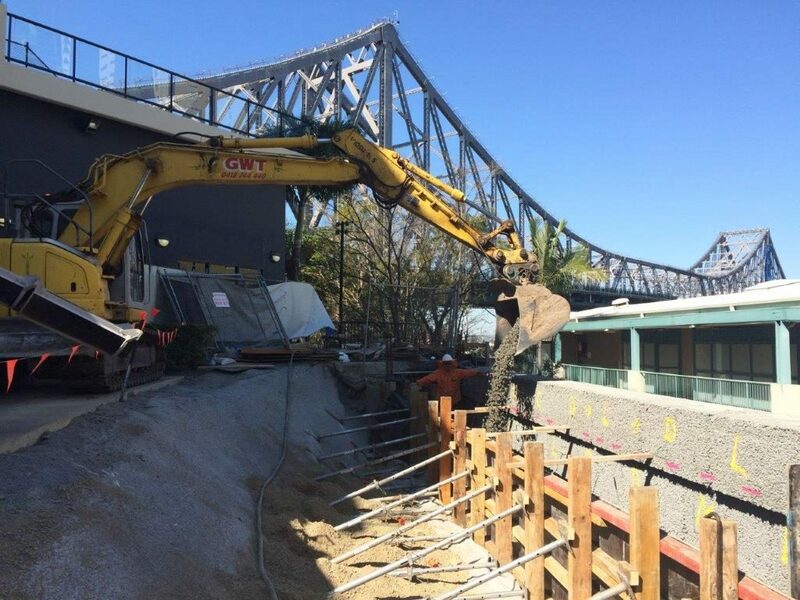 Graviti® concrete blocks were used to address stability requirements and 100 year design life criteria for the Brisbane City Council project. See how Graviti® Blocks were used as the retaining wall portion of the Ivory Lane Walkway Replacement. 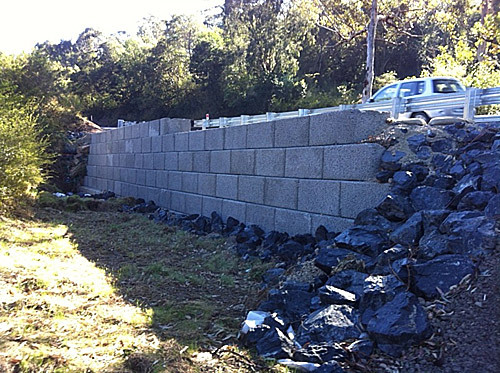 Construction time is dramatically reduced – especially on large retaining walls – simply because large blocks can be made out of the Graviti® concrete. 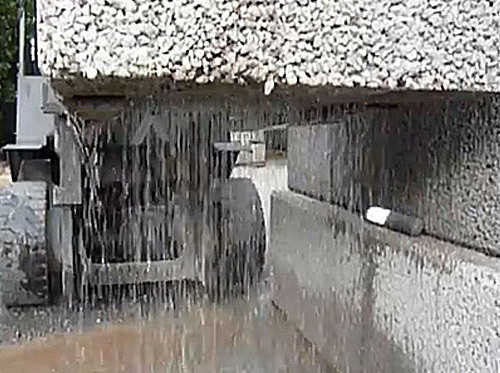 Traditional systems could only accommodate small blocks or bagged products (gravel, sand) which are labour and time consuming in the construction process. Also a Graviti® Block wall doesn’t require a separate drainage system which often takes longer to construct than the actual wall. For example, one project featuring Graviti® Blocks took only four and a half days compared with a similar project using conventional materials and methods which took six weeks. The production process allows for easy handling without a compromise in structural integrity. 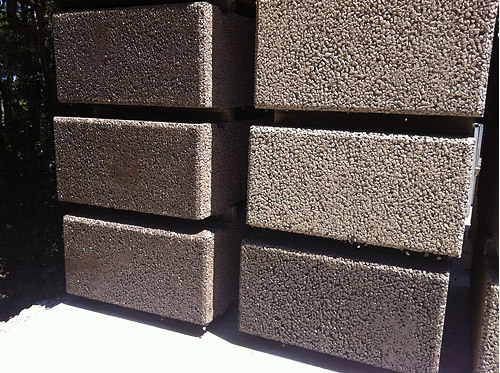 Moreover, the cured Graviti® block’s scientifically proven strength – equivalent to regular concrete – ensures larger sizes can be made according to project requirements. And most importantly, much larger blocks are able to be safely lifted into position leading to a dramatic reduction in construction time. 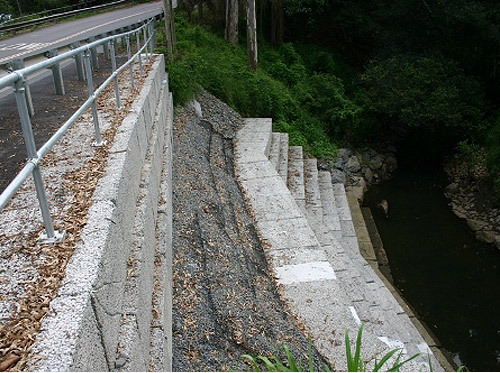 For major retaining walls, like revetment walls, bridge embankments and the like the Graviti® Block is usually the core product used. It dramatically reduces water build-up. Because of its extreme porosity, large volumes of water can escape quickly. In fact, compared with traditional methods, permeability can be increased by up to 2000 per cent or up to 20 times more water than common drainage options. The Graviti® Mattress comes in a standard size (210 thick x 1200 x 1200) and has a number of applications including, slope stabilisation, scour control, pipe outlets and spillways. The Graviti® Mattress can also be used for reinforced turf whereby it is laid in soft wet conditions, then turfed. This provides a firm surface for regular usage including that of light vehicles and pedestrian paths. Light vehicle access tracks in eco sensitive areas is another application.